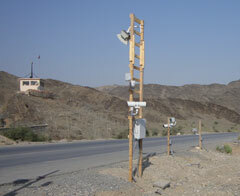 Transport Data Systems has completed the installation and checkout of a combined vehicle profiling and image capture system at the ISAF Torkham Forward Operating Base in southwestern Afghanistan. The system identifies ISAF supply vehicles passing the base on route A1, after entering Afghanistan from Pakistan through the Torkham Gate. TDS supplied license plate and container number readers in addition to an overview camera. The patented TDS laser based profiling system generates a 3D profile of each vehicle that travels past the sensor array. Metadata from the laser profiler is combined with metadata gathered from multiple color images of each vehicle to identify ISAF vehicles as well as other vehicles of interest, per ISAF specifications. Traffic statistics, images, profiles, and various vehicle identification markings are presented in real time to ISAF personnel and are archived for later review. This automated system provides 24/7 surveillance and replaces the previous manual counting method which required placing personnel near the roadway. Future plans include installation of an additional 10 sites in Afghanistan.